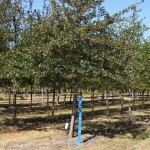 A small, rounded, thornless tree with glossy dark green, leathery leaves. The flowers are white, appearing in late spring, followed with bright red fruit. The fall color is orange. Disease resistant and tolerant of wet and poor soils. It prefers full sun, but will tolerate partial sun.